As I mentioned in the last post, I will continue to write about digital marketing topics for some more time :) In this blog post, let's try to understand about Local SEO, what it is and how to do it? A search for Dominos Pizzas in Cochin provides search results as show above. Two components are of interest to us. 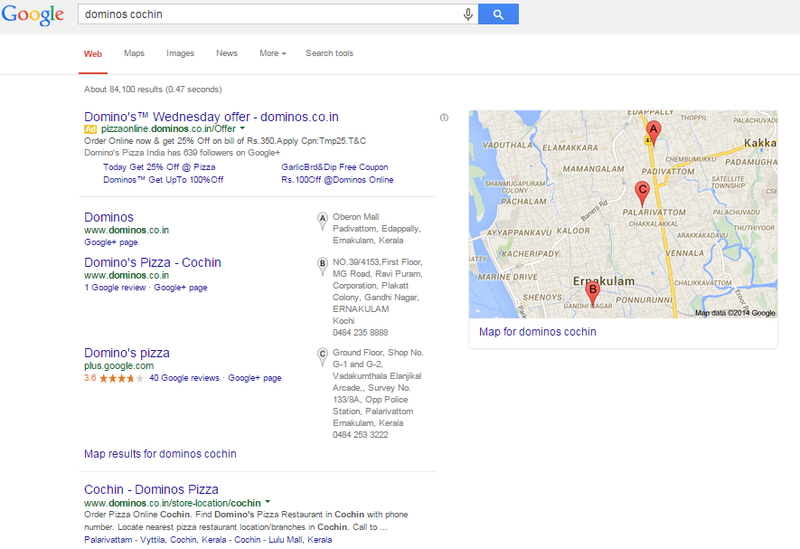 Along with the regular 10 search results, it shows a map with pins pointing to the location of Dominos stores in Cochin, Kerala, India in the right top end. 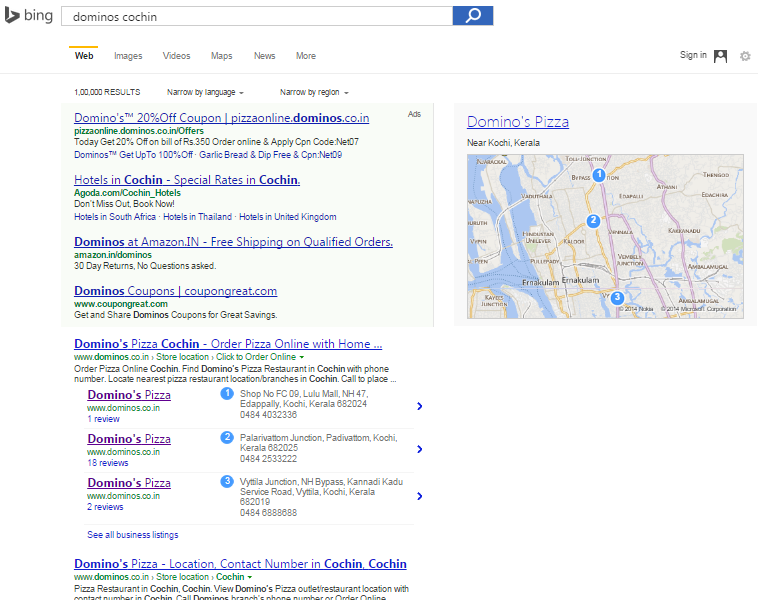 On the left we can see Google Plus pages pointing to Dominos stores pages. This is populated from Google + Local pages. Local SEO in essence is trying to get the such listing of your business at the top in such results. A similar experience is offered by other major search engines like Bing. For example, let's consider the same search query in Bing. 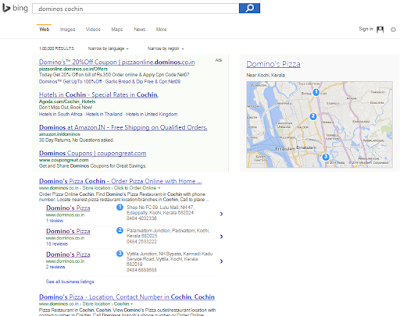 In the case of Bing search results, instead of Google + Local pages; we see Foursquare pages of Dominos. Thus as you might have guessed, the first step in local SEO is nothing but creating the appropriate business listing in Google + Local, Foursquare or Yahoo Listing. Creating this listing accurately helps in populating the results in both map and the local search result carrousel. Having said that, it's not just enough; another important aspect is citations. Citations are nothing but listing of your business in other online directories - like Yelp or Tripadvisor or Justdial and so on. Any information provided that can identify your business can be considered as a citation (like Name of the company or Phone number). The most importance caveat here is to keep the information given across these platforms consistent. In a way, this is going back to the old days of SEO - adding to directories. Having said that, citations doesn't mean - limiting yourself to these directories; the platforms could be any thing from Google + pages to niche platforms like Tripadvisor or simply your own blog. Adding the listing in these directories is just the first step. The next obvious step is keep the listing vibrant. One possibility is with managing reviews in these sites. Tripadvisor is a good example. Consider you are a resort in Chennai; Reviews, testimonials, photographs uploaded by both you and visitors etc. add credibility to both the search engine and prospective customers. In essence this is an overlap happening between SEO, community management and social media. This is equally applicable to Google + Local or Foursquare. The next pillar for your local SEO is your website itself. Adding the consistent citation in your website - whether it is in your contact us page or in footer, is very important. This is in fact one of the signals used by search engines to decide the local relevancy of a website or business. Utilizing a schema markup for this largely helps the website. Schema mark-ups convey search engines aspects like reviews and business hours from the website content and helps in populating the search engine pages. Utilization of schema markup is not just limited to NAP (Name, Address, Phone) or working hours; for the complete list of possibilities, visit schema.org web page on local business. Another important utility of schemas is in managing testimonials. Having a page or section in your website for testimonials and adding a proper schema format to it helps not only gaining credibility to visitors; but also search engines may show them in search results. Finally, we haven't talked about the most important player in local SEO - The Mobile. Day by day, mobile device is becoming the backbone to local searches. Enhanced GPS capabilities, better screen capabilities and connectivity helps in improving the search quality in mobile devices. Thus the final pillar of an effective local SEO strategy is giving its due respect to mobile websites. Making your website readable in mobile, having an app strategy and so on comes into picture. How dynamic is your listed page in these directories. This not only includes how accurate the information is; but also about how creative were you in using the listing. For example, have utilized the Photos & Videos sections? , have you utilized the Additional Details section? Signals from usual search - signals such as how well are you reviewed, how good is your general website, and so on.